All products are machine-made with a very high precision. In order to construct your building perfectly, it is very important that the foundation is built flat and level. All models can be manufactured to bespoke sizes and the design alterations can be made on request. Impregnated base beams of 40/60 mm for 28 mm wall thickness. Impregnated base beams of 60/80 from 33mm and thicker wall thickness. Wall thicknesses ranging from 19mm to 33 mm, the floor boards are 19mm tongue and grooved incl. impregnated floor joists. For wall thicknesses of 45mm and bigger, the floor boards are 22 mm tongue and grooved incl. impregnated floor joists (floor boards of 28 mm are available at an extra charge). Log cabin construction is made from a tongue and grooved windlock system creating a firm barrier against the elements. 45mm and larger wall logs are a special profile with conical double tongue and groove for even higher stability. Gable and upper wall logs are shaped to the roof angle. Post-and-beam/framework are constructed with mortice and tenon joints. The walls for element houses and pavilions are prefabricated on a framework construction, meaning you just assemble the elements and thereby obtain a fast construction. All components are cut for appropriate length and drilled. The roof deck is constructed from 19 mm tongue and grooved boards. For a wall thickness of 28 mm : purlin dimensions are 60 / 140 mm. For a wall thickness of 33 mm : purlin dimensions are 80 / 160 mm. For a wall thickness of 45 mm : purlin dimensions are 80 / 160 mm or stronger depending on the size of the building. (buildings with a minimum wall thickness of 45 mm are suitable to hold slate tiles). Optional straight or cambered barge boards at the gable ends. Triangular tilt fillet at the gable for better water drainage. Standard roof shapes according to each model range are:- saddle roof, hipped roof, flat roof, mono- and double-pitch roof as well as pyramid. Pavilion models up to a max. 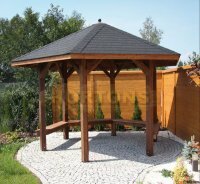 diameter of 4.0 m can have the roof-top elements pre-assembled and can be delivered pre-shingled upon request. Buildings with a minimum wall thickness of 45 mm and skeleton models may also be tiled by the customer. (Please specify when ordering).